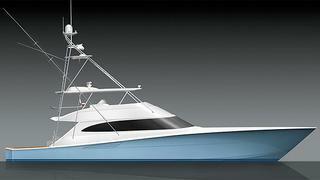 Following a recent battery of tank testings, Viking confirms the start of construction of its largest sportfishing yacht in its 49 years of history, the Viking 92 Convertible. This future flagship of the American yard will have a length of 28.45 metres. Built in composite to an in-house design, she will be available in open bridge and enclosed bridge configurations. The Viking 92 Convertible will accommodate 10 passengers in five cabins, including a full-beam master, two doubles and two twins and separate crew quarters for two are accessible from the cockpit. Scheduled to be launched in spring 2014, the first Viking 92 Convertible will make her debut at the following Fort Lauderdale Boat Show.